On Saturday, August 1st, Apple Valley Live! 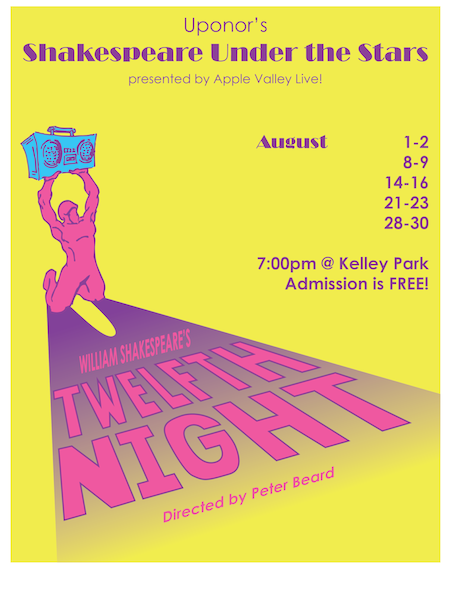 Theatre Company starts its thirteen performance run of Shakespeare’s “Twelfth Night.” As with Music in Kelley Park, all of the shows are FREE! “Twelfth Night” is a fun comedy for the whole family. $5 Pizza will be in the park during these shows, so you can purchase pizza and pop to enjoy while the show is going on. Our summer performance season is at about the halfway point, and it’s definitely time to give a big shout out to our generous sponsors. Without the help of these businesses, the AVAF couldn’t do anything we do–no concerts, no theatre, no donations to our public school arts programs. None of it. We operate on a shoestring budget. All of us on the Board of Directors and the Board of Advisors are volunteers; we receive no compensation, we take no money away from the programs we present. But, believe it or not, it still costs a LOT to bring in performers for all of us to enjoy! Please review this list of our excellent sponsors and, whenever you can, give them your business. They are doing something really good in our community, and we hope you will help give back to them. We also have to give a huge thanks to both the City of Apple Valley and the Apple Valley Parks and Recreation Department for all of their assistance with our programs. We are so fortunate to live in a community that holds the arts as a core value! See you all tonight at Kelley Park for Michael Monroe! Concerts resume on Friday, July 10th! Hi, everyone! We had a brief and unexpected “vacation,” because our June 26th show got rained out and we were off for July 3rd. But, we’re back in Kelley Park this Friday, July 10th, with Patty Peterson and Friends! We’ll also have Relay for Life with us, and wagon rides from Lazy K Ranch. It will be a great night for the whole family, so make sure you join us!